Posted by admin in activity reports, Colombia, Galeras, Machín, Nevado del Huila. Galeras erupted on 25 August: the Colombian geological authority INGEOMINAS described the eruption as ‘of low explosivity’. Ashfall was reported up to 30 km NW of the volcano, and an evacuation order was issued affecting about 7000 people (although as usual few people heeded the evacuation) there were no casualties and no reports of damage. The alert level was raised to the highest level of Red on 25 August and lowered to Orange on the following day. 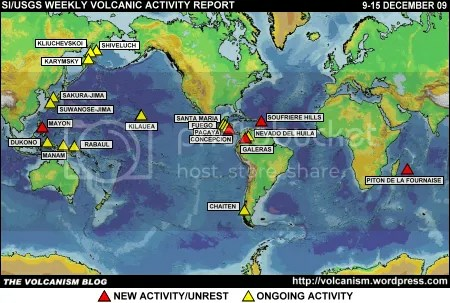 Tremors continued for 12 hours following the eruption before gradually declining. Evidence gathered during an overflight by INGEOMINAS on 26 August suggested that a new crater had been opened by the eruption on Galeras’s north flank. On 7 September INGEOMINAS lowered the alert level to Yellow, at which level Galeras remains. The latest bulletin (14 September) reports a low level of seismic activity and minor gas-and-ash emissions. There have been some signs of deformation since 9 September at the summit of the volcano. Nevado del Huila has a tendency to produce sulphur dioxide emissions, and SO2 plumes from the volcano have been detected frequently since the middle of June. The level of seismicity and its intensity increased, with a greater number of shallow hybrid earthquakes beneath the main summit (Pico Central). Because of this change in Huila’s seismic behaviour, INGEOMINAS raised the alert level for the volcano from Yellow to the second-highest level of Orange on 15 June. Low-level activity continued during June, July and August, with SO2 emissions, fluctuating seismicity and small ash emissions being reported. The alert level was returned to Yellow on 6 July and remained at that level until 9 September, when a marked increase in volcanic tremor and emissions/incandescence at the summit (‘very recurrent and energetic pulses of tremor, associated with pulsing surface emissions of gas, ashes and incandescent material’) prompted INGEOMINAS to raise the alert level to Orange. The Colombian authorities have advised local residents to leave the area, and municipalities around the volcano have been making emergency preparations. The most recent bulletin of 14 September reports continuing high levels of seismicity with pulses of tremor associated with emissions of gas, ash and incandescent material, whitish-blue and grey emissions columns reaching up to 2 kilometres above the summit, and high concentrations of SO2. Nevado del Huila remains on Orange alert, ‘eruption probable within days or weeks’. Machín experienced a volcanic-tectonic earthquake of magnitude 2.6 at 3.87 km depth yesterday, which was felt by residents in nearby towns. Seismic unrest was noted at Machín earlier this summer: on 24 July INGEOMINAS reported a ‘seismic crisis’ characterized by an increase in relatively shallow volcanic-tectonic earthquakes. Machín has been on Yellow alert for a long time, and remains at that level. Posted by admin in activity reports, Caribbean, Chaitén, Chile, Colombia, Dukono, Ecuador, eruptions, Fuego, Galeras, Gaua, Guatemala, Hawaii, Indonesia, Japan, Kamchatka, Karkar, Karymsky, Kilauea, Kliuchevskoi, Nevado del Huila, Pacific, Papua New Guinea, Rabaul, Russia, Sakura-jima, Sangay, Sarychev Peak, Shiveluch, Soufrière Hills, Suwanose-jima, United States, Vanuatu. The Smithsonian Institution/United States Geological Survey Weekly Volcanic Activity Report for 25 November – 1 December 2009 is available on the Global Volcanism Program website. The following is a summary and not a substitute for the full report. 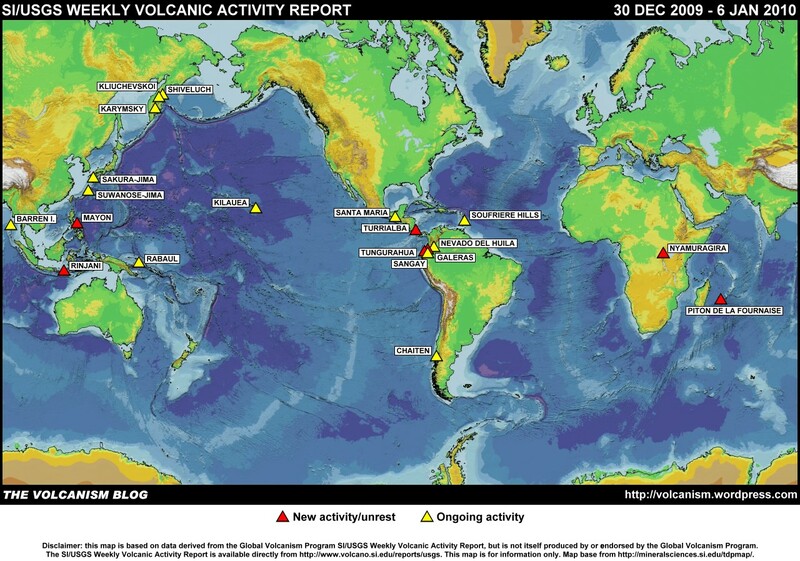 New activity/unrest: Galeras (Colombia), Gaua (Vanuatu), Karkar (Papua New Guinea), Sarychev Peak (Russia). Ongoing activity: Chaitén (Chile), Dukono (Indonesia), Fuego (Guatemala), Karymsky (Russia), Kilauea (Hawaii, USA), Kliuchevskoi (Russia), Nevado del Huila (Colombia), Rabaul (Papua New Guinea), Sakura-jima (Japan), Sangay (Ecuador), Shiveluch (Russia), Soufrière Hills (Montserrat), Suwanose-jima (Japan). Posted by admin in activity reports, Arenal, Bagana, Caribbean, Chaitén, Chile, Colombia, Costa Rica, Ecuador, eruptions, Fuego, Galeras, Guatemala, Hawaii, Japan, Kamchatka, Karymsky, Kilauea, Kizimen, Kliuchevskoi, Mayon, Mexico, Nevado del Huila, Papua New Guinea, Popocatépetl, Rabaul, Reventador, Russia, Sakura-jima, Sangay, Santa María, Shiveluch, Soufrière Hills, Suwanose-jima, United States. The Smithsonian Institution/United States Geological Survey Weekly Volcanic Activity Report for 11-17 November 2009 is available on the Global Volcanism Program website. The following is a summary and not a substitute for the full report. New activity/unrest: Galeras (Colombia), Mayon (Philippines). 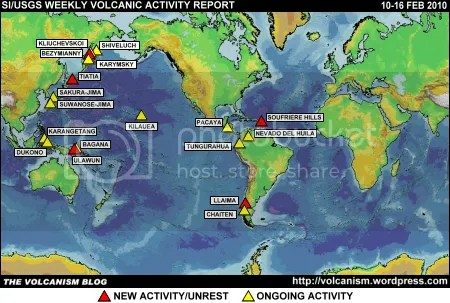 Ongoing activity: Arenal (Costa Rica), Bagana (Papua New Guinea), Chaitén (Chile), Fuego (Guatemala), Karymsky (Russia), Kilauea (Hawaii, USA), Kizimen (Russia), Kliuchevskoi (Russia), Nevado del Huila (Colombia), Popocatépetl (Mexico), Rabaul (Papua New Guinea), Reventador (Ecuador), Sakura-jima (Japan), Sangay (Ecuador), Santa María (Guatemala), Shiveluch (Russia), Soufrière Hills (Montserrat), Suwanose-jima (Japan).